Japanese Episode DP 008: "Gureggru of the Mysterious Gym!" Along the path to Kotobuki City, Musashi-tachi have set up a fake pokemon gym. The trainers who lose are told to leave their pokemon with the trio so they can train them to become stronger, but unbeknownst to them, the "Gym Leader" simply takes the pokemon instead! One day, while on the way back from a convenience store, Nyasu is followed by the poison frog pokemon Gureggru. It follows Nyasu all the way back to the gym, so Musashi decides to use it in battle. Elsewhere, Satoshi and his friends come across a Hassamu trainer named Minae. The young girl tells our heroes about the new gym, so everyone heads that way to challenge the Gym Leader. When they arrive, Musashi decides to battle Minae first. By having Kojirou act as referee, Musashi and Gureggru are able to weasel out of a loss and command the poison frog pokemon to victory. Next up is Satoshi. The trainer from Masara Town uses Aipom against Musashi's Dokucale and wins, so Musashi and the others remove their costumes and kidnap Pikachu! After Mukkuru brings their hot air balloon plummeting to earth, our heroes battle the trio until they're sent blasting off again. Gureggru stays behind and decides to accompany Takeshi on his journey, so the Pokemon Breeder makes his first Shinou region catch. With a new comrade by their side, our heroes resume their journey. I freakin' LOVE Gureggru. The apathetic poison frog pokemon is ridiculously hilarious and provides such great comic relief throughout the series that it's a wonder how we ever made it this far without it. Its capture was a nice surprise since it wasn't spoiled in the opening theme (like just about every other capture in the series), so we'll be seeing a lot more Gureggru goodness in the future. 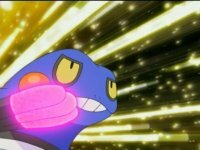 Croagunk's voice is alright, I guess, but it's nowhere near as good as the Japanese voice. I'm sure I'll get used to it the same way I eventually got used to Corphish's voice. The dub also leaves out a humorous aspect of the episode, but I'll leave that for the Dialogue Edit heading below. Throughout this entire episode, Musashi spouts a lot of random English phrases (notice how I wrote English and not Engrish). If you look at the scene where Gureggru first walks into the gym, you'll see Musashi reading a book...and while there's nothing in the script to confirm this, it's most likely an English book she's reading. In fact, Musashi even makes a comment about studying English as she's blasting off at the end of the episode. Well, all of this is done away with in the dub. PUSA could have pulled a Sailor Moon and changed all the English into French or something, but they decided not to. It's a shame because dubbing everything straight kind of kills the comedy in a lot of the scenes, especially the motto. Meowth: "We'll whip your Scizor into the best shape of its pokémonic life!" I swear they're putting that in just to annoy me. So the music in this episode is its usual terrible self, but the part that everyone points out is the staring scene before Brock catches Croagunk. In the Japanese version, there's a moment without any music before they play a song from the Lucario movie. It's the track that plays during the scene where Satoshi looks out into the sky and says "Pikachu" before the shots of everyone driving toward the spot where Lucario was sealed by Arlon. It's Track 19 on the movie's soundtrack for those of you who have it. In the dub, PUSA plays this piece of romantic-ish music that sounds pretty out of place. It almost sounds like the two are going to confess their love to each other or something and really shows how PUSA should have no business scoring music for a series. But I will say this: the piece of music used in the dub is refreshingly long. I've gotten so used to the dub's five second cues that I forgot that they actually have some longer pieces in their music library. The TO BE CONTINUED screen is made a few seconds longer in the dub. As if I have to tell you that.